It’s been a while since I was this obsessed about a show. More than a show; an entire universe spread across many different kinds of media. One of the most appealing aspects of Doctor Who is that it exists in so many forms, allowing for a wide array of stories and expression. And one of the most challenging aspects of Doctor Who is that it exists in so many forms, making it very difficult to track them all down. I’ll say right up front that I haven’t watched any classic Doctor Who. I really hate watching a series out of order, but since there are 100 episodes missing from classic Who, I was reluctant to dive into the franchise at all. However, my friend Storm Elf assured me that I could start with the 2005 series that introduced the 9th Doctor and I would be fine, since there’s a 16-year gap between classic Who and its reincarnation. We watched the first episode together at Katsucon and later she hosted a Doctor Who viewing for the next few episodes. After that, I went through a lull where I didn’t watch any Doctor Who. But in late September 2013, after listening to several Sapphire and Steel radio plays, I felt in the mood for some more weird time-related stories and decided it was the right time to start up Doctor Who again. For the past month and a half, I’ve been obsessively consuming Doctor Who episodes and champing at the bit to find every scrap of this new universe I can feast my eyes upon. Without coming across spoilers, which is pretty tricky. When I get introduced to a new universe and characters that I fall in love with, I go a little crazy. And when I find something as wonderful an brilliant as Doctor Who, it fills every waking moment of my life, churning away in the back of my mind. I do the basics required of me to survive and keep my job (most of the time) and that’s about it. Everything else becomes secondary to watching the next episode. Even now, as I write this, part of me is champing at the bit, eager to plop down in front of the TV, pull up Netflix, and whirl away to another adventure. I’ve started combing through the three library systems I have access to, looking for all things Whovian and debating about what I should borrow, when I should start, and raging over the lack of a comprehensive (but spoiler-free) list of all the Doctor Who media and the order they should be read/watched/listened to. I dare not go on DeviantART to look for Doctor Who artwork, as much as I would like to, for fear of coming across something that will reveal what happens next. After all, I’m a latecomer to this franchise that others have been following for decades, and I want to experience the full shock, awe, and wonder without knowing what will happen next. Luckily, my friend Kei has been my Doctor, the Link-Master, providing me with guidance through the modern Who-verse. Like so many wonderful things, I’d never really understood what the fuss was regarding Doctor Who. I didn’t quite grasp the idea of the Doctor’s regeneration, a unique asset that allowed the series to survive far longer than any other. I didn’t understand the wonder behind the doors of a simple, blue police box, or what the hell a “sonic screwdriver” was. The ideas, presented so plainly, seemed both unappealing and tacky. To be fair, I did try to watch some of the 1st Doctor and yes, it is rather cheesy-looking. The times did not allow for very elaborate sets and the acting and premises seem pretty silly by today’s standards. Even now, after becoming a Whovian, I realize that, spoiled as I am by today’s technology, I’ll have to be in a special kind of mood to watch and enjoy the early incarnations of the Doctor. It was, as a library patron put it, “A different kind of story-telling.” But the latest incarnation of Doctor Who, beginning with the 9th Doctor, really expands on the potential shown in the early Doctors. The exploration of the Doctor’s character, his interactions, values, loves and losses….it’s fascinating. At their best, both Star Trek and Doctor Who challenge preconceptions, explore new ideas, and illuminate the darkest reaches of the human soul. When you cut through the cheesier episodes and the not-always-stellar special effects…that’s what you get. And I think that is what makes Doctor Who and Star Trek so appealing. They aren’t just eye candy and mindless explosions; they actually make you think. They present interesting scenarios that aren’t seen or aren’t possible in other shows. And the characters are people who can not only identify with, but also aspire to be like. One of the great things about Doctor Who is that, for the most part, the people look and act like people. It would be easy to cast just gorgeous women in the role of Companion or just handsome men in the role of the Doctor. But to the show’s credit, most of the main characters are striking, normal-level-of-attractive, or interesting looking rather than the kind of air-brushed beauty that only occurs in 0.2% of the human population. It makes them so much more human and over the course their time with the Doctor, his Companions change and find hidden strengths within themselves. The Doctor, the madman in a blue box, helps to bring out the best in his Companions, just as they help keep him anchored. Because of all these entwining factors, Doctor Who is a show that makes you feel. My God…you feel jubilation and sorrow, euphoria and grief. You laugh and sob along with them, sometimes over the course of a single episode. 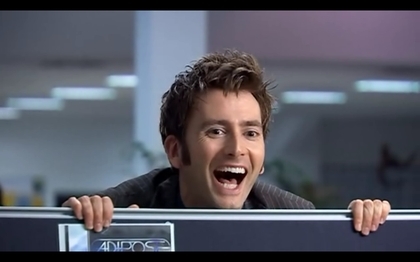 I can’t express how much joy and pain I’ve felt watching Doctor Who. My heart has been broken and knitted so many times that I’ve lost count. Especially with the 10th Doctor. I love 9 for his darkness and I’ve grown to love 11 for his light, but 10, the bridge between them, will, I think, always be my favorite. David Tennant: the man who decided at age 6 he wanted to be the Doctor, became one of the most popular Doctors of the series, and married the real-life daughter of the 5th Doctor, Peter Davison. How brilliant is that? So what does any of this fangirl blather have to do with writing? To me, Doctor Who proves that the key to a lasting universe lies in the characters. Doctor Who isn’t always the best-written show. Some episodes are brilliant. Others have lots of holes and lots of things that don’t make sense and continuity errors and stuff that’s just plain ridiculous. It straddles the gap between pure hilarity and dark drama, and the characters are the glue that holds it all together. They are what keep and draw in fans. The first 5 episodes with the 9th Doctor were interesting, but nothing really special. It was the 9th Doctor himself and his Companion, Rose, who intrigued me, who kept me moving forward, episode to episode until I suddenly realized how much I cared about them and wanted to see them through to their journey’s end. I haven’t stopped caring ever since. That, my friends, is the key to good writing, to making it last, for your story to resonate in the heartstrings of your readers. The readers, your Companions, have to care enough to keep running beside you.